New virtual cockpit previews have been posted from the upcoming ATR 72-500 for X-Plane 10. Just Flight has released the 737-100 Expansion Pack to the Black Box Simulations Boeing 737 Professional for FSX. David Molyneaux has released the freeware Foster Wikner Wicko G.M.1 for FS2004. Available to download at BritSim. The freeware Soekarno-Hatta International Airport (WIII) scenery for FSX is now available to download at Simviation. The TropicalSim Flores Airport (LPFL) scenery is now also available for FS2004. Purchase at SimMarket. simFlight.com has posted preview screenshots from the upcoming Sim-Wings Fairbanks International Airport (PAFA). RealAir Simulations has posted another daily screenshot from the upcoming Lancair Legacy for FSX. First screenshots from the upcoming Linz Airport (LOWL) scenery for FSX have been posted in the Friendly Flusi Forums. First previews from the freeware Fitzroy Crossing Airport (YFTZ) scenery for FSX have been posted in the OZx Forums. The NL2000 Team has added more screenshots from the upcoming version 4.03 update to Netherlands 2000 for FSX. The freeware Antonov An-225 Mriya PAX for FSX is now available to download at Rikoooo. A_A Sceneries has posted the first previews from the upcoming Macau International Airport (VMMC) scenery for FSX. Rotorfsx from the Hovercontrol Forums has posted more renders of the Hughes 500C/D under development for FSX. New Zealand Vector Land Class (VLC) has released the freeware Waihi Beach Airport (NZWV) scenery for FSX. Orbx has released the Walker Airfield (OR57) and Hobby Field (77S) scenery package for for the FTX NA PNW Region. - Animated flags that react to wind conditions! - Includes FREE BONUS OR57 Walker Field! GrandSurf has posted another ground detail teaser from the fictional SM1 Airpark near Brownsville Oregon for FSX. Twentynine Palms Scenery Design has posted more preview screenshots from the upcoming Mykonos Airport (LGMK). Ed 'Geneer' Cox has posted another screenshot from the upcoming Warren County Airport (KGFL) scenery for FSX. FSAddon has posted more details and another work in progress screenshot from the upcoming Lockheed Hudson. Flying Stations has released the Hawker Sea Fury Pack for FSX and Prepar3D. More information at the Product Page. -- With two speed supercharger, altitude sensitive throttle and automatic prop control. -- With performance based on the original Bristol Centaurus maintenance manual. - Coffman Starter - Start every flight with a bang! - Multiple load outs - Select drop tanks, bombs or rockets. - RATOG - For short field and carrier operations. Drzewiecki Design has posted more preview screenshots from the upcoming FSX version of Miami City 2012. Classic Wings has released the freeware ERCO 415 Ercoupe for FSX. Details and download at the Product Page. Carenado has posted more preview pictures from the upcoming Cessna CT182T Skylane G1000 for FSX. Blue Sky Scenery has released the freeware Los Angeles - Part 4: Southeast photo scenery for FSX and FS2004. Hamda Houcine has converted the freeware ISDproject Fiumicino (LIRF) & Punta Raisi (LICJ) airports for FSX. 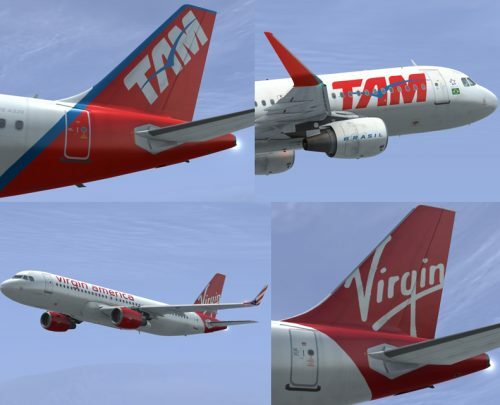 Aerosoft has posted more livery previews from the upcoming Airbus X Extended for FSX. Taxi2Gate has posted the first preview image from the upcoming Toncontín Intl. Airport (MHTG) for FSX and FS2004. FranceVFR has posted more preview screenshots from the upcoming Aquitaine Photo HD Vol.1 scenery for FSX. The d'riv freeware SOCATA Rallye 100 for FSX has been updated to version 0.8. Available to download at d'riv.fr. The recently released Just Flight English Electric Lightning for FSX is now also available to purchase at SimMarket. RealAir Simulations has has posted the first daily screenshot from the upcoming Lancair Legacy for FSX. VOZ Sydney Airport (YSSY) Version 2.4 Update for FS2004 is now available to download at the OZx Website. HiFi Technologies is currently offering a 30% discount on Active Sky 2012 for FSX. Offer valid through June 30th 2012. Rotorfsx from the Hovercontrol Forums has posted another render of the Hughes 500C/D under development for FSX. GrandSurf has posted more ground detail previews from the fictional SM1 Airpark near Brownsville Oregon for FSX. feelThere has posted more screenshots from the upcoming Tracon! 2012 ATC simulator on the feelThere Facebook Page. Black Box Simulation has posted previews of the 2D pedestal from the upcoming Airbus Xtreme Prologue for FSX. Joe Herwig has released the freeware Pattonville Airport (EDTQ) for FSX. Available to download at AVSIM. Aerosoft has posted more preview screenshots of the virtual cockpit on the upcoming Airbus X Extended for FSX. Aerosoft has announced development of Toulouse-Blagnac Airport (LFBO) for FSX (FS2004 version might follow). Aerosoft is offering a 20% discount on select aircraft during the Aircraft Galore Sale. Valid through May 20th 2012. Cestomano has released the freeware La Palma and La Gomera photo sceneries for X-Plane 9 & X-Plane 10. Thai Creation has posted another screenshot from the upcoming Kathmandu Tribhuvan Intl. Airport (VNKT) for FS2004. Nemeth Designs has released the Eurocopter AS355 Ecureuil 2 for FSX. Details and purchase at the Product Page. - Working hoist system on the utility variant. - Controllable search light on the law enforcement variant.